The Minister of Industry, Dr. Hussein Al-Hajj Hassan, was present at the opening of the Lebanese Standards Institution – LIBNOR Training Center at the Institution’s headquarters in Sin El Fil. The event also featured the launching of LIBNOR’s new website www.libnor.gov.lb in the presence of the Chairman of the Board of Directors, Eng. Habib Ghaziri, the Director General, Eng. Lena Dargham and the staff. The new training center will provide training services to the public and private sectors in the fields of quality, food safety, social responsibility, energy efficiency, carbon and water footprint, medical laboratories and management systems. The aforementioned training sessions were determined after a survey was sent to all stakeholders, and they will be developed and updated to meet national needs. Moreover, LIBNOR revealed its new slogan “Co-Creating Responsibility”, aiming at working on sharing responsibility, finding a common responsibility with all stakeholders in Lebanon, continuing to develop its services to provide citizens with better services and contributing to the improvement of quality and safety levels in Lebanon”. Eng. Lena Dargham, the Director General, said: “The launching of this training center falls within a comprehensive strategy aiming at affirming the Institution’s pioneer position at the national, regional and international levels. We already published more than 2700 national standards for all sectors and we will keep elaborating national standards to meet the changing needs of our stakeholders. Our national standards currently constitute the main scientific reference for all ministries involved in the surveillance and inspection campaign that is being conducted, and for laboratories that conduct testing and sampling”. 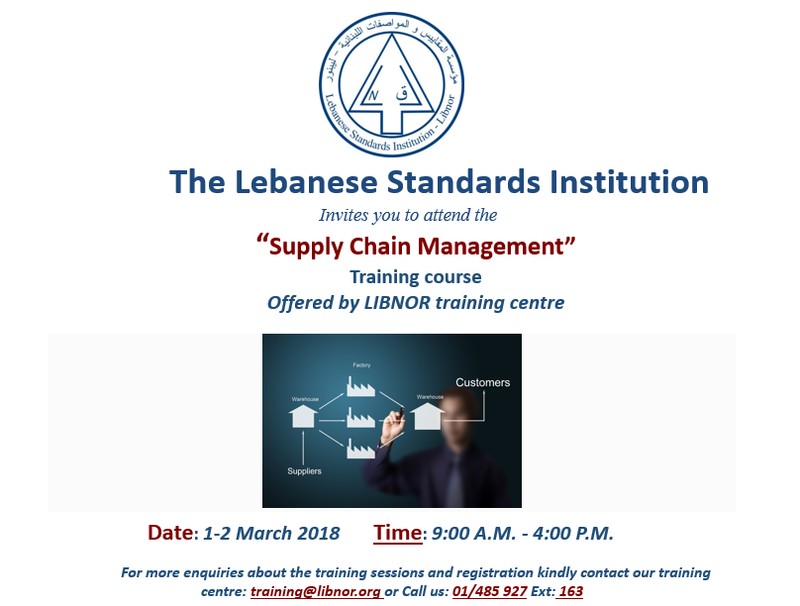 The Director General also added that: “LIBNOR is currently granting the NL Conformity Mark to products that are in conformity with Lebanese Standards and we are working on establishing a system to encourage factories and plants to apply for the NL Mark”. She then thanked the Minister of Industry for “his continuous support to LIBNOR”, the Chairman of the Board of Directors and all staff members for their efforts and enthusiasm, and acknowledged “the efforts of the Head of the Services Department Mr. Mohamad Chamas, who worked hard to establish this center and oversaw the elaboration of the new website, in addition to the fulfillment of his other duties in LIBNOR”. Eng. Ghaziri thanked Minister Al-Hajj Hassan for his patronage, his presence and “the continuous support he provides to LIBNOR”. He also praised the enthusiasm and performance of all staff members who fulfil their duties with competence and responsibility”. He then added: “the effort made by LIBNOR under the instructions of Minister Al-Hajj Hassan made it take on essential roles internationally within the strategic committees for developing countries in ISO, set Arab strategies in the field of quality and standardization and assume the tasks of the Regional Coordination for the Codex Alimentarius Commission”. Minister Al-Hajj Hassan stated: “I am honored to take part of the opening of the Training Center and the launching of the new website at the Lebanese Standards Institution, within a clearly defined plan that aims at outlining LIBNOR’s path, role and future actions, in accordance with a comprehensive national vision for the Industry and production stages, as well as for manufactured and imported products, with regard to safety in general and food safety in particular. Moreover, even though LIBNOR is a small institution in terms of budget and staff, its impact is very big. We should never underestimate the process of elaborating a Standard or granting a Conformity Mark, as this process has a big impact and large economic effects. The World is witnessing a strong competition between the addition or the ban of a new substance in a certain product, which is determined by Standards and affects the budget of the project, in millions of dollars in savings or additional expenses”. The Minister then addressed LIBNOR staff members saying: “You are preparing the scientific base of the national Economy and this role is definitely not a small one, as both the financial world and manufacturers turn to the scientific base”. He added: “Lebanese officials were lately focusing on the food safety issue which is important and essential. However, the main base used to ensure food safety is built upon standards and technical regulations which constitute mandatory standards. This is where LIBNOR’s role comes into play, for it has worked during the past years to convert a large number of optional food standards into mandatory standards. We, at the Ministry of Industry, LIBNOR and the Industrial Research Institute (IRI), will keep adopting a steady path that leads to quality in production. 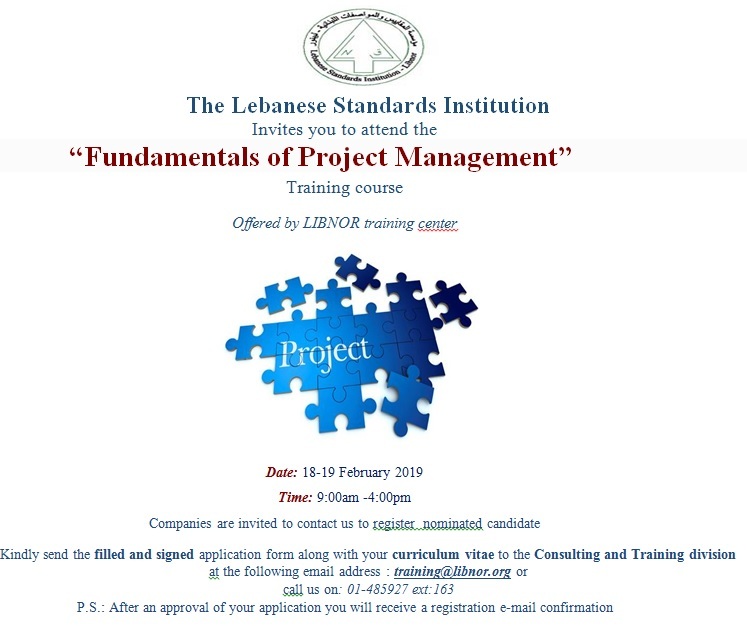 LIBNOR elaborates and published required standards and it has now extended its activities to cover training provision by opening this new center. Specialized training sessions will be organized at all levels to train both the private and public sectors, production managers in industrial institutions and workers. This project will pave the way for rendering training compulsory for all employees and workers who will be granted certificates that are deemed appropriate for their type of activity. It is not acceptable anymore that a normal worker, whose job is related to food safety, performs his work tasks without undergoing at least one training session that is appropriate to his function. Therefore, we have to set rules and boundaries”. “There are many other titles related to general safety without pertaining to food safety. LIBNOR has indeed elaborated in this concern standards for buildings, iron. Aluminum, electric toys, lifts, electric appliances and others. There is also a rising interest within LIBNOR and its stakeholders in standards related to the safety of workers in factories and plants. LIBNOR is also working on promoting quality to help manufacturers export and market their products and services. We all know that the increase in productions costs, unfair competition and dumping are significant obstacles that deprive the Lebanese product from its capacity to compete with other products. However, there is another factor that is really important and it is related to quality and if it is unavailable and has no high standards the commodity becomes difficult to market. The consumer is ready will pay more for a certain item that he would for another item because it has a better quality. Yet, this does not mean that quality is limited to high cost products”, stated the Minister. He then discussed the “role of good and organized governance in improving performance and that can be achieved through the training sessions that will be organized by LIBNOR”. The Minister described energy as “both the problem and the solution for the Lebanese industry. The main challenge is finding a way to reduce energy cost in production processes and diversifying its sources, since the country’s electric power and oil extraction issues are unlikely to be solved any time soon”. Regarding the environmental impact, Al-Hajj Hassan said: “It is perfectly normal that environmental impacts be negative. However, we need to find ways to reduce these negative effects to low levels and this is where social responsibility should come into play to encourage companies and institutions to sponsor the poorest categories through more developed educational, health and social programs”. When asked about the food safety law, the minister replied: “the food safety draft law was approved by the joint parliamentary committees and is on its way to Public Assembly for ratification once we reach a political agreement on the legislation”. A presentation was made at the end of the event to introduce the new website that was built in accordance with the governmental website standards elaborated by OMSAR.